THE PICKIEST EATER IN THE WORLD: THE CROSSROADS.. I'm honestly leaning towards the right.. I'm sure Rina, Karen, Leslie, and my new buddy Roxy can relate! This was too good to not post.. Thanks to my bud, Paul Fuentes for sharing! what good is youth if it's one without fountain of bacon, right? the only thing i'm worried about is that fountain of bacon sounds logistically weird. the altar of bacon is more like it. or something like that machine that shoots out tennis balls/baseballs. obviously i've been thinking about this A LOT. hahaha. Haha Roxy! The Altar of Bacon actually exists! I don't know if you saw my post already but I found it here! i've a major thing for breakfast buffets if only for the bacon they serve. i was totally excited about the hotel breakfast buffet in KL until i realized it was a muslim country and therefore, no bacon. so when we had dinner at Karl's Jr. on one of our nights there, i was excited, cause there was this burger with bacon thing. i was like, hmmm, maybe they're lax when it comes to fast food. guess i was too excited i didn't read the fine print which said "chicken bacon". major sadness. I agree. Turkey bacon tastes like crap. 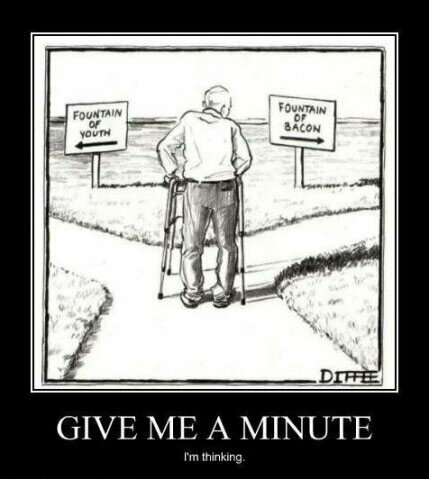 I have a comment on the dilemma, if you choose the fountain of youth that means you can eat all the bacon you want since you won't be aging or get affected by all the bad things in it. Good point Rich! but the thought of swimming in bacon makes a strong case as well haha!